All fireplace dampers leak energy - even new ones. 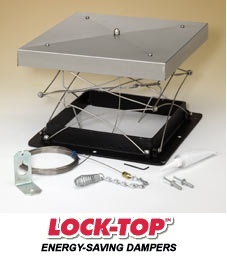 So if you have a chimney, you need a Lock-Top top sealing damper! The Lock-Top Chimney Damper is like a storm door for your chimney - locking the unconditioned air outside, and keeping the expensive, conditioned air inside. You will be saving energy dollars year-round! Constructed with a stainless steel lid attached to a cast aluminum frame by an array of stainless steel springs. Features a chimney fire safety device that locks the damper open in case of a chimney fire. Install the Lock Top Damper along with the EZ Sweeps Ring (not included) and make removing the damper for cleaning your chimney a whole lot easier! Now open your chimney damper with even more ease! The EZ Open Damper Handle mounts to the wall of the firebox. A lightweight extension slips over the handle, and the opens the damper with minimal effort.